This is a wonderful cartoon published in LIFE MAGAZINE in 1956. This is a great piece, with all of the detail and beauty Wolverton is famous for, the back of the paper has the title and gag along with publication stamps. Page is pen and ink on paper. 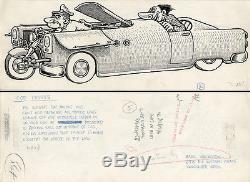 Pen and ink on paper (14 1/2 x 5 1/4 inches), excellent condition. Initialed by Wolverton on the front, signed with his address on the reverse. All kinds of great artists here. The item "BASIL WOLVERTON Cop Carrier LIFE MAGAZINE ORIGINAL COMIC ART 1956" is in sale since Friday, February 24, 2017. This item is in the category "Collectibles\Comics\Original Comic Art\Other Original Comic Art". The seller is "chesslove" and is located in Jersey City, New Jersey.